So, I got promoted. Heeee! It took effect 1st Feb but the funny thing is, I got sick for two weeks and only came into the office half way through the month. What a way to start at my new position! Anyway, it's been HECTIC since I returned. So much to do, so little time. I knew this when I accepted the position but sometimes the amount of work seems overwhelming. The team has been working well together, though I still haven't really found the time to properly sit down with them and initiate myself. I have so many people to thank for my promotion, most of all my previous boss who was such a great mentor and friend. People have been asking when I'm gonna do an open table...hahahaha..it's not that I don't want to, it's just that I really need to find the time to do so. Insya'allah, hopefully early next month. Till then, it's tons of work awaiting. Nothing comes for free anyway. ...memperkuatkan lagi decision aku untuk tidak pregnant lagi! Serious. Pening, Badan lemau. Sakit badan. Pitam. Seksanya. Itu blum masuk book lagi, rasa nak muntah 24 jam, sembelit, cramp kaki, sakit belakang, bleeding, hidung ultra sensitif, kluar masuk spital ambik drip...huhuhuhu...cukup la tu..
Aku dapat bayangan rasa tu selama 2 minggu pun dah tersangat seksa...tak sanggup nak pikir kalau 9 bulan aku rasa camtu lagi. Nak2 la ngan umur aku yang dah makin lanjut (uhuk...marah Sal kalau aku cakap aku dah tua...kita seumur ya!! )..lagi la aku rasa mesti out giller2 aku kalau preggers lagi. Silap2 terus cuti keje setahun. No play2. Aku dah banyak kali hint kat En Rashid yang aku dah tutup kilang, tapi aku rasa mamat tu antara percaya tak percaya la. Sekarang ni dia tak la mendesak, sebab dia tau aku tengah belajar lagi. Nanti bila aku dah grad bulan 9 nanti (insya'allah), mungkinkah dia akan ungkit subjek ni. Oh tidak. Bukan aku tak teringin anak lagi. Kekadang bila tengok baby, rasa geram je, rasa nak cubit2 pipi baby tu. Tapi ingat2 balik part ngandung, aku surrender. Kalau aku jenis yang preggers senang, tiap2 tahun aku bunting. Percayala. Sapa yang pernah rasa demam denggi ke, demam sejuk yang sakit sendi2 tu...bleh agak2 la camne aku rasa time preggers. Sapa yang pernah kena muntah2 cirit birit, bayangkan la 24 jam sehari selama 9 bulan ko rasa camtu. Sanggup? Kekadang bila aku cite kat orang pasal aku takmo pregnant lagi, kebanyakannya menggeleng kepala. Cakap, aku muda lagi la, tanya aku takmo anak lelaki ke, warning nanti En Rashid ada alasan carik bini muda. Takpela...aku dah ada 3 puteri comel2 ni pun dah sangat bersyukur dah. Kalau En Rashid nak jadikan condition aku sebagai sebab nak menambah bini, silalah. Huhuhuhu....beranikah dia? Wataaaaa...karate kick nanti flying nanti. Hehehe..
Only it wasn't cute. It was torture. 2 weeks of feeling sick. It all started with a cold fever, then a very bad cough and faint spells. After numerous blood tests and a couple of days in the hospital, the doctor diagnosed me with acute bronchitis plus viral fever. I started feeling sick the day we all came back from Kuantan. I took two actifast pills and normally that would do the trick. But it didn't and I started having the chills. Like it felt like ice water was running through my veins. I went to the clinic and the doctor gave me some antibiotics and pills for my flu. The next day, I started getting diarrhea and headaches. My fever was still there so En Rashid took me to the hospital near our home. The doctor did a few blood tests and gave me two days of MC. Whatever I had, it was different from what the kids had had, so I waned to know the cause of it. I missed classes because I really couldn't even sit up due to my pounding headache and really bad cough. On Monday I wen back for another blood test. My fever had gone but I was still feeling sickly and lightheaded. The doctor cleared me for denggi, which was a relief. On Tuesday, I went to work. I had a 930am meeting which I went straight to. It was at that meeting that I started to feel lightheaded and out of breath. It scared me a bit coz it was kind of sudden. Fortunately the meeting ended quickly and I called up En Rashid to take me home. He took me to the hospital instead which was a good call coz the doctor confirmed that my blood pressure was too low and apparently the viral fever was still there. They gave me a drip and after reviewing my blood tests, the doctor decided to admit me for observation. So I stayed in the hospital for 2 nights. The food was good though, apparently there was no problem with my appetite. I did still feel kind if weak; simple tasks like going to the toilet made me out of breath. I took this up with the doctor and that's when he diagnosed me with acute bronchitis. I dunno if it can lead up to light headiness coz that's what concerns me the most. Anyway, that kind of explains the reason I've been quiet for the past 2 weeks. I'm feeling better now and I have an inhaler in case I have difficulty breathing or anything. The doctor said it may take up to 8 weeks for the viral fever to really go away and for my bronchitis to clear up so I'm to avoid strenuous activities. Hmmm, I hardly think that's possible once I get back to the office. But I'll have to try. I only have one body to take care off anyway. Plus being sick just blows. All three of my babies are sick. Boohoo! It started actually with Daria, we suspect she got food poisoning from the drink we bought at the night market. Actually it was more of the ice cubes that she chewed on, must have been made from unfiltered water. 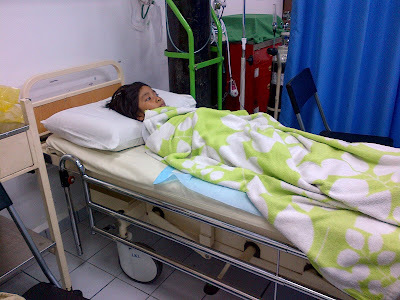 So anyway, this was actually last week and for almost a week, she was vomiting and had diarrhea. Then as Daria was getting better, Dania got sick and started getting the same symptoms. She came back from school on Tuesday, complaining about a stomach ache. That night, she started vomiting and having the runs. So far, she's missed 4 days of school. Last Wednesday night, Dina started vomiting. I was getting really worried, especially since Daria was just getting better. So on Thursday morning, both En Rashid and myself took the girls to the hospital. Both Dania and Dina had to be put on a drip because they were vomiting excessively. They cried a bit when the nurse placed in the needle but only because their veins were so shrunk from the dehydration. But after a bottle of saline, they both felt better. 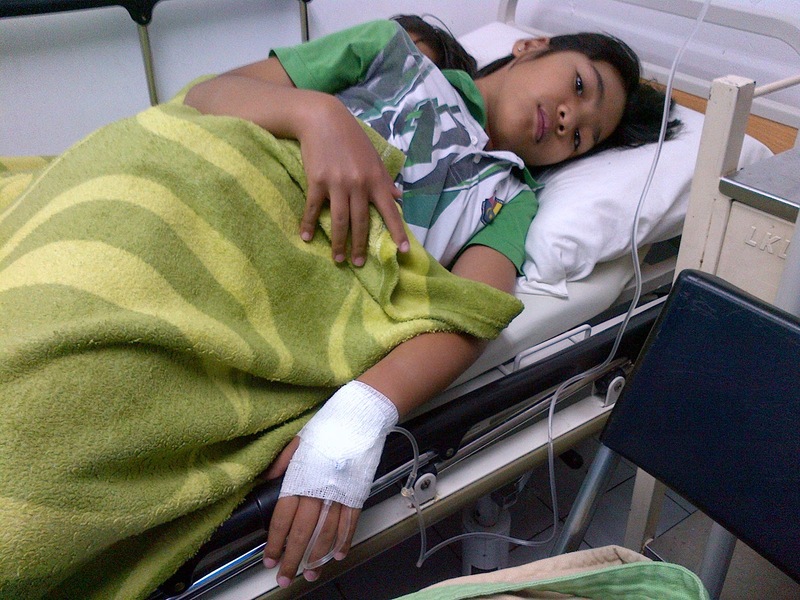 Fortunately the doctor said that they could be released and stay at home, instead of being admitted into the wards. As of today, Dania about 90% better. She still has the runs but she hasn't vomited since yesterday. Dina vomited twice today but I think it's due to the powder medication she has to take. So I've stopped that for now and tried to get her to drink chocolate milk instead. Here's hoping my babies get well soon. The other day, Dania mentioned about her Kajian Tempatan project she had to do during CNY. Apparently, she had to create a cave out of plasticine, following the instructions in her text book. 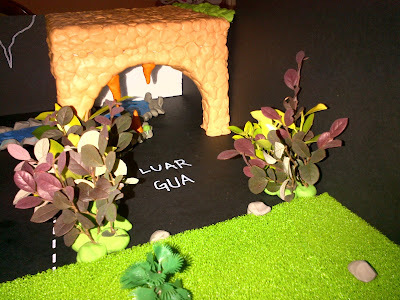 I tried googling some videos on how to make a cave; most of the videos I found used paper mache and were too complicated for my limited creativeness. So I called my brother to help. This is what they finally came up with. It cost me approximately RM60 to buy all the stuff for her cave but looking at the final result, was so worth it. My brother helped a lot, in terms of the design and layout. The frame of the cave was made out of polystyrene and then covered with balls of plasticine. Dania helped roll bits of plasticine into balls while I helped my brother cover up the polystyrene. The bushes were actually leaves from the trees in my mom's garden, taken with permission of course. The grass was fake grass, bought at the art shop for RM7 per piece. Initially we wanted to create the grass using plasticine, but figured that would just take up too much time. 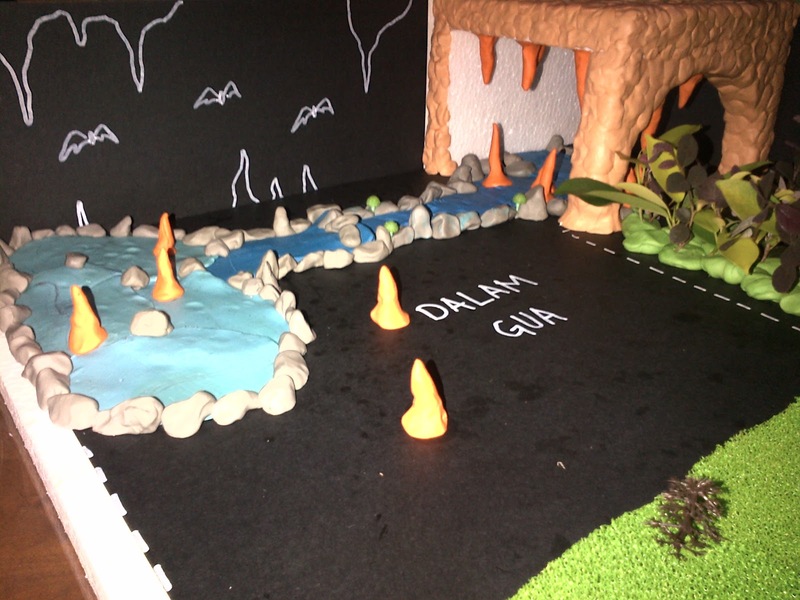 Dania also created the "boulders" using grey plasticine and the stalactites and stalagmites using orange plasticine. My brother helped arrange them around the stream and pond. 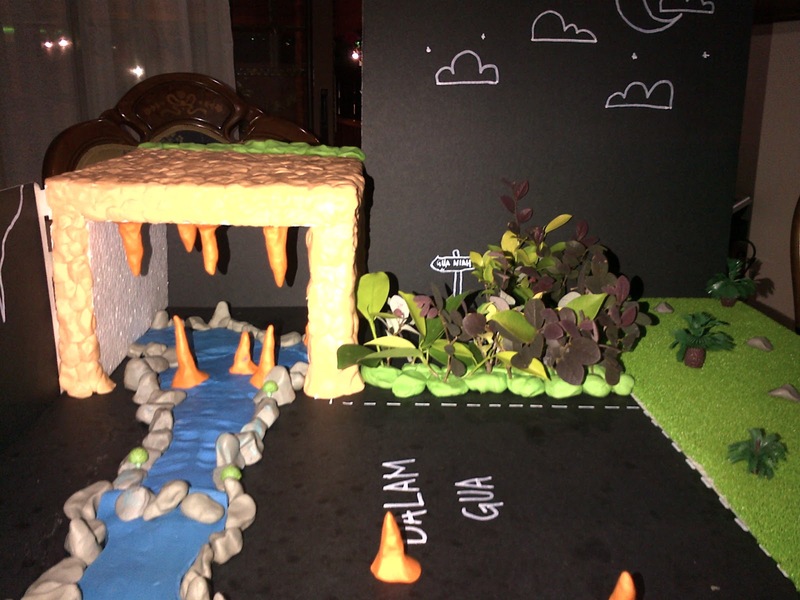 En Rashid complained that the cave looked too "boxy" but actually we ran out of plasticine. My brother wanted to use something to create a roundish shape for the top of the cave but we were worried that the polystyrene might not be able to hold the weight. So a "boxy" cave it is. 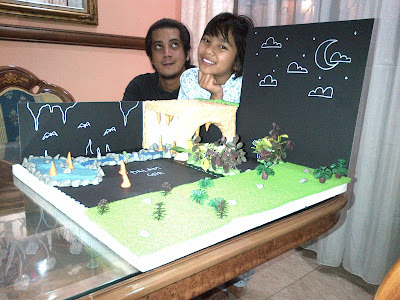 Which was just fine, because Dania got A+ for her project! !